We arrived in Keflavik Airport from Amsterdam around noon. The airport is around 45 minutes away from the city center of Reykjavík. This city isn't as well connected as other Europeans cities. There is no tram or train available for going around. People go around by bus, cab, or if near enough, walking. We booked our bus ride to the city online. This allowed us to save time as we avoided the queue at the ticket counter. Halfway through the trip, we overheard bad news from other travelers. Severe weather was forecasted the next day. As we already made tour bookings for our stay, including our Airbnb arrangements, we were quite worried that our tour the next day will be cancelled. For what remained of the day, we walked around the outskirts of Reykjavík and familiarized ourselves around the neighborhood. We intended to catch as much of the Northern Lights as we can, so we booked a hunting trip that night given the moderate forecast. We spent the day walking around the city. We walked to the Hallgrímskirkja at the height of the storm and we were nearly blown off the path. Jaysen and I had to duck and take cover behind the statue of Leif Erikson then scamper into the church. The church tower is the highest structure in the city offering a sweeping, colorful view of the city from the top. It was a challenge to get around as the winds were still so strong and it was really cold, that we jumped into the first available transportation we saw. We hopped in a Hop On Hop Off bus without thinking. It was the single worst decision we made during that trip. My only consolation is that it was between paying for the most expensive bus ride in my life or freezing/being blown away. The short bus ride took us to Harpa. The building's architecture is spectacular, the impressive facade, grand staircase, and intricate ceiling. It is a work of art on it's own. From Harpa, we walked to the City Hall and the around the Old Town. Then we walked back to Hallgrímskirkja to have a proper traditional Icelandic dinner at Loki's Café. Do not get on a Hop On Hop Off bus. You don't need it and it's a total waste of money. Early day to tour the Snæfellsness Peninsula in the west part of Iceland. This part of Iceland is less popular but is well worth the trip. Our tour was a day trip booked with Nice Travel which I highly recommend. They have the most amazing and entertaining tour guides. We have a small group and it was comfortable ride. For this trip, we had Thor (not THAT Thor!) with us. Having a guide named Thor made me feel a little bit more comfortable, he might just get out us out of any situation. :) The day started with a visit Ytri-Tunga to look for some seals. Unfortunately, we didn't see any but it was all good, the landscape was beautiful nonetheless. :) Next stop was Arnarstapi, which is an old fishing village named after a mythical creature, half human, half ogre. There are natural ports here and cliffs that drop to the raging ocean. Platforms are well situated to allow visitors to birdwatch or just marvel at the huge lava formations. The winds are very strong near the cliffs and it was misty when we went so it was a challenge to get decent photos. Thor shared a mesmerizing tale as we were enroute to Djúpalónssandur. According to him, this beach was once believed to be the edge of the world. some four hundred years ago, when people still believed that the world is flat, Columbus declared it to be the "end of the world" as there can see no other landmass from the beach and waves are crashing murderously. In reality, thousands of miles away, the next large landmass from this beach is Brazil. So he said. To get to the beach, one will have to navigate through a rocky descent with only feeble ropes to hold on to. It was extra hard for us as we went during winter, thus we have to walk on an icy trail. One mistake and we will fall off the cliff. I think. The waves that day were crazy huge and angry, the wind blowing strongly. It takes more and more effort to walk nearer to the beach. The wind was so strong that even if I let myself fall backwards, I can't. The wind propped me up. Behind the beach is a contradiction. There lies a quiet, calm, and beautiful lagoon. Next stop is the majestic Kirkjufell. This mountain is one of the most photographed mountain in the world. And no wonder. It has a beautiful symmetry covered in snow. In front for the mountain is a short trail with a few charming waterfalls. Drones are not allowed here. Believe me. The day ended around 9PM. Snow was falling. Check first if drones are allowed in the ares. Even if they are, sometimes it's best to just leave it in the van as the trails may be difficult. Warm you gadget. 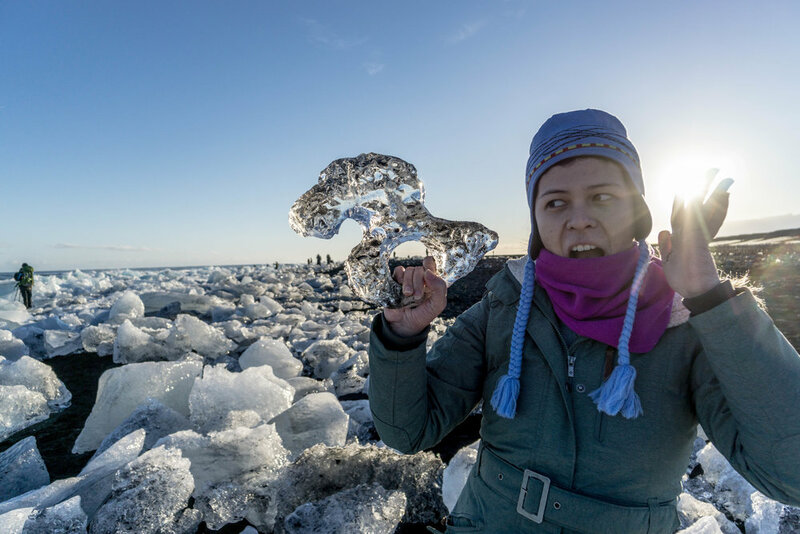 Our DJI Osmo froze on us on several occasions. I'm at the end of the world! Remember that big storm in day one that threw our plans out the window? Well, this day is the what i call the collateral damage. This was supposed to be the "free" day we planned at the tail end of our trip to allow us to wind down in the city, join a walking city tour, just wander around, and have enough time for the las bus trip to our accommodation near Keflavik. Well, not anymore. Now, it became an awkward in betweener as we have a full two days ahead. But for the moment, we have half-day left as we were dropped off from the Golden Circle tour. My hope of joining the walking tour went down the drain as we were dropped past noon. There's one more scheduled in the afternoon, but the big upside to a wrecked plan is new opportunities to try something new. What's a visit to Iceland without having an encounter with the famed Icelandic horse? That afternoon, we not only got to pet Icelandic horses, we rode them too!! This was not part of our itinerary but I am very glad we did a last minute booking. We went with Íslenski Hesturinn which included pick-up and drop-off. They are, for me, the best horse riding service provider. It was my first time to ride a horse without a lead holding him for me. I was able to do it! With careful and very detailed instructions from Begga, I was able to manage my horse Athena quite well. We were all taught how to tölt. What an exhilarating experience, we passed by different landscapes and lava formations along our way. Begga is the instructor and owner of the company and she gives heart to every experience. You can really feel how much she loves these gentle creatures. Aurora forecast for that day is at a five. This is a rare occurrence, but for that entire week, we were having fantastic daily forecasts. Again, at the last minute, after dinner at Icelandic Fish and Chips, we booked an Aurora watching cruise. The price is much steeper that the bus tours, but hey. While waiting, we already saw the northern lights dancing in the harbor. Pretty strong show tonight. Then our boat left to go farther into the sea where there are less city lights, but again, something unexpected happened. One of the engines started to malfunction and the crew couldn't fix it. So, back to the harbor we go. We we told we can join the later cruise leaving at 11PM or refund our payment. We opted to refund as we have an early day the next day. All is well that ends well. Our consolation prize was that we stumbled upon the most famous hotdog stand in Iceland, Bæjarins Beztu Pylsur, and ate our disappointment out. Those are seriously delicious hotdogs. Never let the hotdog pass. Though this outlet near the harbor is popular because of Bill Clinton, you can get the same hotdog in stores around the city. Moving boat + low light camera settings = blurry photos. If you intend to have magnificent aurora shots, don't do it from a boat. The next two days was spent along the south coast of Iceland. We went with the same tour company as the Snæfellsness tour, Nice Travel, this time with Antonio as our guide. He was a superb guide: funny, knowledgeable, and a little bit of MacGyver. He made sure everyone is safe while having fun. Importantly, he ensured that our driver gets enough rest. :) He also brought us to some "secret" spots which I found enjoyable as there were no large crowds our tour buses around. Our group was quite small, so the ride was very comfortable. 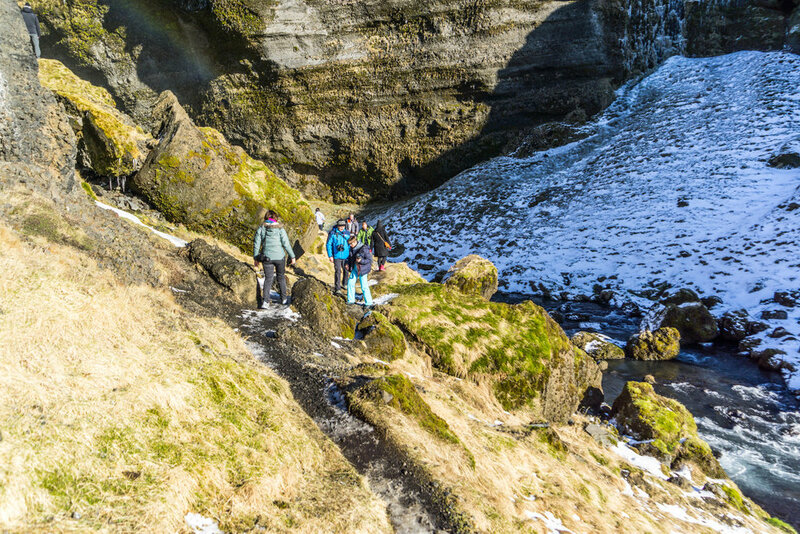 In this tour we went to Skógafoss, Reynisfjara where we saw the basalt sea stacks along the the shore, passed by the village of Vik and spent the night in a nice hostel middle of nowhere. This was the most ideal place to catch the northern lights as there is little to no other light source. We had an open field all to ourselves where we played and set-up our cameras. We were treated to a nightlong show of dancing lights. The next day was spent exploring Jökulsárlón glacier lagoon, ice caving in Vatnajökull with super fun 4x4 ride on the glacier. We then proceeded to the Diamond Beach where glaciers are washed ashore or are floating nearby before heading. The drive back to Reyjavík took around five hours. We were supposed to stay near Keflavik for the night so that we can travel comfortably to the airport the next day. Unfortunately, we made it back to the city around 11PM, too late for the last bus trip during winter which is around 4PM. We had to spend the night in the bus station, fortunately it wasn't that long as the first trip to the airport was 3AM. More on this tour in my following posts. Tour will stop by restaurants for meals. You can opt out and eat in the van if you brought some food. That will be a little sad though. The budget for tours and food are variable. You can scrimp or splurge here. For the tours, we admittedly opted to spend more here so both of us can enjoy rather than have one of use drive. We were just not confident driving in a strange land for long distances. We would rather not waste time being lost, figuring out maps, or worse be in an accident as tourists account for more than 80% of road mishaps in Iceland. Eating in Iceland is quite tricky. First, it is expensive. There is no McDonalds around for a quick bite. There is one KFC in the suburb. The cheapest meal/snack we had was the hotdogs at around Php 200 a pop. Simple sandwiches from convenience stores cost around Php 300.00. If you stop by Joe and the Juice (their local version of Starbucks), you shell out around Php 600.00 for a sandwich and a latte. If you want "real" food, fish and chips go for around Php 1000.00. Traditional café where they serve lamb soup, shark, and other delicacies charge a bit more. Shop in a grocery like Bonus if you pass by one if you accommodation allows simple meal prep.